Enoch the prophet appears quite early in the Bible. I Enoch and the Epistle of Jude state Enoch was the "seventh from Adam", the son of Jared, and the father of Methuselah. He is discussed briefly in Genesis 5:21-24. "And Enoch lived sixty-five years, and became the father of Methuselah. Then Enoch walked with God three hundred years after he became the father of Methuselah, and he had other sons and daughters. So all the days of Enoch were three hundred and sixty-five years. And Enoch walked with God; and he was not, for God took him." Enoch was one of only two men in the Bible to not die, the other being Elijah. Not only that, but he "walked with God" for three centuries before he was taken up! Enoch was the first man since Adam Scripture says walked with God. Enoch the prophet was unquestionably a righteous man. After spending such time with God, it is most reasonable to believe God showed him and taught him things that were incredible beyond imagination. The original Hebrew text placed the definite article in front of "God". This separates God as "the God". This may be an implication society was beginning to worship other gods at this time. Enoch, however, lived a life in strict compliance with the God. "Then David chanted with this lament over Saul and Jonathan his son, and he told them to teach the sons of Judah the song of the bow; behold, it is written in the book of Jashar." 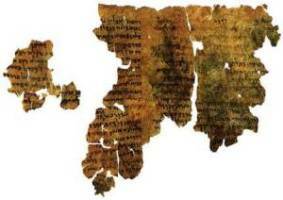 The book of Jasher falls into the same category of literature as the book of Enoch. This Apocalyptic Literature never found its way into our Bible, which was defined by the Catholic Church. However, it is quite plain these books were counted as Divine in the Bible. They contained vital information from God. David felt this book contained an important enough song that he required "the sons of Judah" to learn it. Chapters 3 and 4 of the book of Jasher has very interesting things to say about Enoch the prophet. chapter 3 opens up with the birth of Methuselah. After which, Enoch is said to have walked in the ways of the Lord and served the Lord. Enoch's righteousness can be clearly seen in Jasher 3:2. "2 And the soul of Enoch was wrapped up in the instruction of the Lord, in knowledge and in understanding; and he wisely retired from the sons of men, and secreted himself from them for many days." Enoch the prophet possessed such an intense righteousness, his soul was "wrapped in the instruction of the Lord". It was not just Enoch's heart which was pure, but his entire being, his very soul was connected to God. He felt the impulses of his day creeping into his heart, and he fled the temptations wisely. Not only was Enoch the prophet righteous, he was a very prudent and wise man. He foresaw trouble, and sought to avoid it when necessary. He needed God, thus he fled to God. The book of Jude reveals one of Enoch's prophecies during his life. This is the only prophecy of his mentioned in the Bible. However, a man which walked with God for three centuries, and then was taken up, surely uttered more than just one prophetic message. Share Your Thoughts on Enoch & the Nephilim Do you have a theory as to the Nephilim? Are you a student of Enoch? What are your opinions on the book of Enoch and the Nephilim? Click on the above link to give us your insight, thoughts, comments, and questions! "And about these also Enoch, in the seventh generation from Adam, prophesied, saying, 'Behold, the Lord came with many thousands of His holy ones, to execute judgment upon all, and to convict all the undgodly of all their ungodly deeds, which they have done in an ungodly way, and of all the harsh things which ungodly sinners have spoken against Him.' "
The book of Jasher continues with Enoch the prophet faithfully serving God. Enoch the prophet is attributed by the book of Jasher as teaching the way of God to all of mankind. He reigns over king of the people, and peace was said to have been upon the earth. Enoch slowly began to withdraw to God for longer periods of time. Eventually, it got so Enoch would only appear to the people one day out of the year to speak the words of God to them. 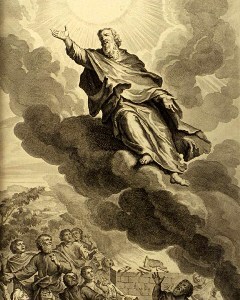 "20 And he did in this manner for many years, and he afterward concealed himself for six days, and appeared to his people one day in seven; and after that once in a month, and then once in a year, until all the kings, princes and sons of men sought for him, and desired again to see the face of Enoch, and to hear his word; but they could not, as all the sons of men were greatly afraid of Enoch, and they feared to approach him on account of the Godlike awe that was seated upon his countenance; therefore no man could look at him, fearing he might be punished and die." Enoch the prophet had ascended to such holiness people were afraid to look at him. The kings of the earth gathered together, awaiting anxiously the day Enoch the prophet would address the people. A man of such righteousness, who spent incredible amounts of time one on one with God, ruled righteously over his kingdom and his people, would find favor with God on a level very few have ever experienced. 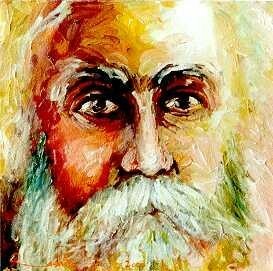 The altering of his appearance is also present in the Bible after Moses encounters God! God soon felt it necessary to bring Enoch into heaven. Thus, the book of Jasher depicts his ascension into heaven. It is interesting that a horse drawn chariot is what takes Elijah into heaven as well. "27 And at that time the sons of men were with Enoch, and Enoch was speaking to them, and they lifted up their eyes and the likeness of a great horse descended from heaven, and the horse paced in the air; 28 And they told Enoch what they had seen, and Enoch said to them, On my account does this horse descend upon earth; the time is come when I must go from you and I shall no more be seen by you. 29 And the horse descended at that time and stood before Enoch, and all the sons of men that were with Enoch saw him." The life of Enoch the prophet had ended on earth. He was 365 years old when he was taken up. Enoch's name, however, lived on. His son Methuselah was made king in his place. He ruled righteously as well, and God blessed him. However, the book of Jasher states in the latter days of Methuselah's rule, man strayed from God, and much wickedness was upon the earth. 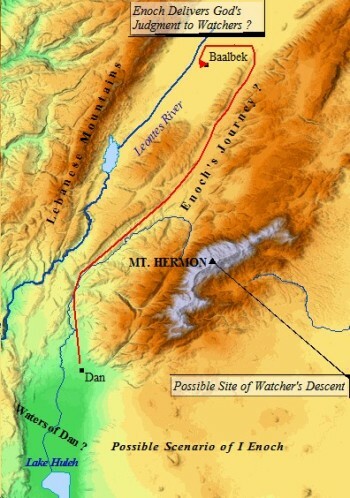 Enoch's line of descendants found much favor in the eyes of God, due in large part to the character and heart of Enoch. His son, Methuselah, became the oldest man in the Bible, living 969 years! 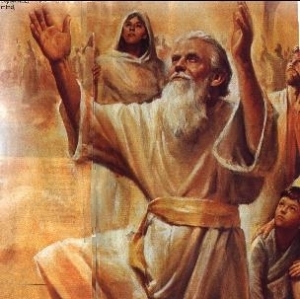 Enoch the prophet was also the great-grandfather of none other than Noah, the preserver of mankind! It is no coincidence Noah was chosen by God to escape the flood. As shown above, Abraham would eventually emerge from this particular line of descendants. This was the very line of the promised "seed of the woman". Enoch the prophet is thought by some to have been the first man to write letters. God surely taught him this during their three century relationship on earth. Moses would have presumably possessed these writings. The book of Enoch is the collection of Enoch's teachings and visions he received from God. I Enoch is a fascinating description of the events in Genesis 6. The books of Enoch go into great detail concerning the Nephilim , and the state of the earth in those days. Enoch the prophet remains a mysterious individual in Scripture. However, one cannot deny his righteousness, and the fact God revealed great and wonderful mysteries concerning His judgment in the last days. Consider the words of the prophet Joel, which has puzzled scholars as to the date of its writing as well. "And it will come about after this that I will pour out My Spirit on all mankind; And your sons and daughters will prophecy, Your old men will dream dreams, Your young men will see visions. And even on the male and female servants I will pour our My Spirit in those days. And I will display wonders in the sky and on the earth, Blood, fire, and columns of smoke. The sun will be turned into darkness, And the moon into blood, Before the great and awesome day of the Lord comes." Perhaps, God is preparing His people for that very day of judgment through the revealing of some of these lost texts. Bn.com offers The Book of Enoch. This apocalyptic work of literature, written by the prophet Enoch, is one of the most important books ever written. No other book impacted the New Testament as the Book of Enoch. Enoch fully explains the mystery behind the Nephilim in Genesis 6. God called Enoch to His Throne, and ordered Enoch to confront the fallen Watchers. Click on the link below to visit barnesandnoble.com and The Book of Enoch! Margaret Barker fully explores Enoch's influence on Christianity in her stunning book, The Lost Prophet: The Book of Enoch and Its influence on Christianity. Barker has made Enoch and his writings available for the non-specialist reader, fully exploring the world of scholarly research and language in an easy to understand way. She brings to light the importance Enoch played in early Christianity, and sheds insight into the New Testament! Click on the link below to visit ecampus.com and The Lost Prophet: The Book of Enoch and Its influence on Christianity! Click on the link to continue to The Book of Enoch part 1 of 3.